Breakfast is over and for the second day in a row my four year old son is out on the tennis court having a hit with an obliging and good natured boy of about eight. The previous day we go onto the court together – with Xavier and I taking it in turns tossing balls over the net and hitting them back. After an absence from the court of close to a year (makes him sound like a pro doesn’t it?) it takes a while for him to get into the swing of it – but perseverance is rewarded and he soon regains a strong – if at times inaccurate – forehand and a decent attempt at backhand too. Today – his friend is out there before us so mummy becomes obsolete – at least for half an hour or so. 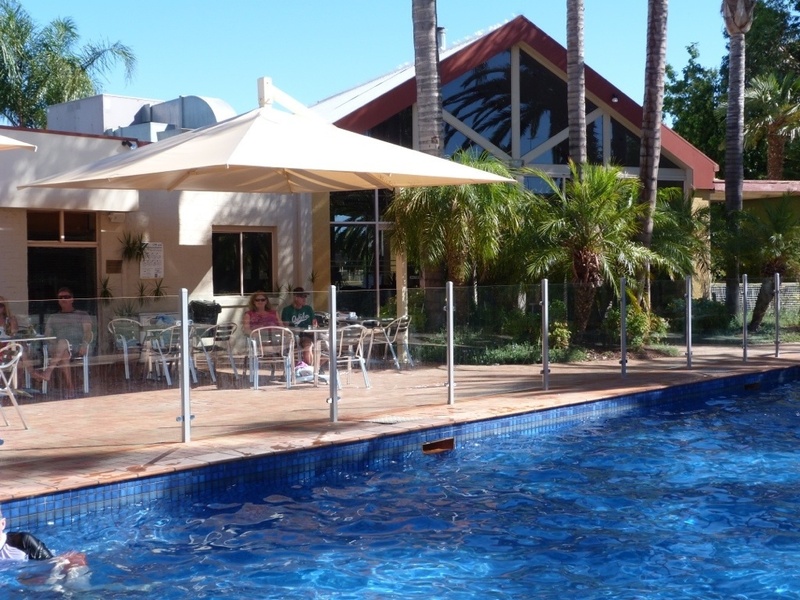 There is a lot to be said about resort holidays – which is a big reason why I booked us in for a few days at the Quality Resort Inlander in Mildura, Victoria, Australia. At this time of year – Victorians traditionally head to the beach. However with somewhat ordinary weather, no airfares booked and a four year old to entertain my criteria are: warm weather, sunshine, a drivable distance, a decent pool, nice rooms and a high likelihood of other families, and specifically kids, being about. The Quality Resort, a six hour drive from Melbourne, four and a half hours from Adelaide and ten and a half hours from Sydney has all this…and then some. It is in Mildura, on the Murray River, the largest river in Australia, the southern bank of which forms the border of NSW and Victoria. The rooms are spacious, tastefully if simply decorated and clean. Our Deluxe King room – booked through wotif.com at a rate of $105AUD per night – has a king sized bed, desk, table with two chairs, and a two seater sofa with a good six square metres of open space and an ensuite bathroom (no bath). The rooms and pool area have all been recently refurbished – and are both comfortable and pleasant. This is no five star resort – more of a motel with some great facilities – but it certainly deserves every one of its four stars. The resort wraps around a lovely garden area – complete with water features, ponds, fish, gazebo and chairs and tables scattered in shady spots throughout. Perhaps surprisingly, the gardens are a big hit with my son who goes on big adventures looking for treasure, animals and pirates while exploring the paths. Two wings of rooms also wrap around the central pool area and two tennis courts – only one of which appears to be in use. There is a kids play area with slide, swing and monkey bars directly behind the tennis courts. The pool is on rough estimates is about 20 metres long and maybe six metres wide, fenced and only about 1 – 1.2 metres depth with one end slightly shallower than the other. It’s fine for lap swimming or the raucous carry on of kids which fills it late afternoon. The good thing for us is that there are plenty of families about which means plenty of kids to play with and plenty of adults in and about the water to make sure things don’t get out of hand. The guests are all friendly without being overbearingly so and the ambiance of the resort is a huge drawcard. Moving onto the adults – there is a bar area in the main reception area directly behind the pool which means you can wander in for a sundowner while lounging around the pool, the Gazebo is fitted out with a BBQ and BBQ packs can be ordered from reception. The restaurant is simple but the food is good and service excellent. A buffet breakfast is included in the rack rate. There is a kids menu for dinner with a number of options of two courses plus drink for a very reasonable $12AUD. All members of the waiting staff we meet are friendly and accommodating and importantly attentive to and patient with children. And parents for that matter. They indulge my curiosity with an offer to sample the wine before deciding which to select to accompany my delicious dinner of barramundi with mango and cucumber salsa – and don’t flinch when it takes three attempts to find something to my liking. Dinner from the kids menu is a winner! The atmosphere and set-up of the resort remind me of some of the more reasonably priced family friendly resorts in south east asia. We definitely recommend this for anyone with kids seeking a place for a summer holiday or even to escape the Melbourne or Canberra chill in autumn and spring. In fact, we love it so much up here we have decided to extend our stay.